Using the simulator consists of assembling parameters and market data onto a number of simple sheets and then calculating VaR and CVaR by clicking the button on the main control panel (shown below) for the type of simulation required. Position data. Positions can be linear (eg shares; cashflow-mapped bonds) or options. Asset Details depending on the simulation type. 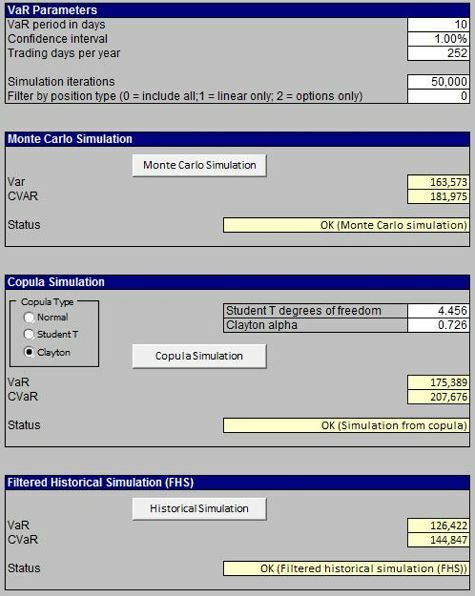 For example, correlations and volatilities for Monte Carlo simulation and for some copulas; Student T degrees of freedom for copula simulation. Historical price data for historical simulation. The Finance Add-in for Excel includes tools to estimate all inputs required, such as volatilities and correlations, copula calibration parameters, GARCH parameters (for FHS), option "Greeks" etc. The VaR Simulator application uses the VaR, copula and other components from the Finance Add-in for Excel. More information. The Hoadley VaR Simulator is free to download to users who have purchased the Hoadley Finance Add-in for Excel and are still within their one year free download period.